I hope you've steeled yourself for the annual Dangleway maintenance closure, which starts today. For seven whole days the cablecar will be out of action to allow for electrical testing, weight testing and a full inspection of the sheave wheels. So in the meantime, here's an update on danglestuff. • You'll be aware from repeated announcements that contactless payment is a great way to save time by avoiding queueing. Except on the Emirates Air Line, that is, where contactless payments don't work. There is "an expectation that they would be included in a subsequent phase", but for now you either need to have an Oyster card or a boarding pass, the latter acquired from the ticket office. If you've already binned your Oyster, as directed, rest assured that "most contactless payment cards can be used to buy tickets at the ticket offices at the Emirates Airlines terminals." • Speaking of which, the ticket office at North Greenwich station will be closing for good next Monday. Or rather the ticket office in the ticket hall by the ticket barrier will be closing, because that's deemed unnecessary. Meanwhile the ticket kiosk at ground level will be remaining open, to continue its essential job of flogging tickets to tourists visiting the O2 who might not otherwise realise the cablecar exists. Then there's the ticket office at the southern cablecar terminal where a couple of red-jacketed staff sit in the warm and await custom, and of course the ticket office at the terminal on the other side of the river, that stays open too. The reason for the different treatment is of course that the cablecar caters mostly for tourists, and tourists need corralling and a lot of help, and is not in any way a hypocritical decision. Whatever, it might be fun to go up to the cablecar staff sat in their little box at North Greenwich next Monday and ask them to top up your Oyster. It'd be a futile pointless gesture, yes, but it might be fun, no? 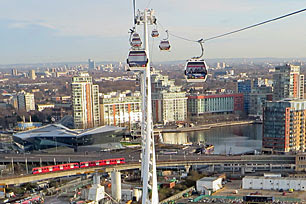 • In the press release accompanying news of the cablecar closure, Dangleway boss Danny Price says "We apologise for any disruption the maintenance closure causes passengers." Normally officials apologise for any inconvenience, but Danny has chosen the word 'disruption' carefully because the only disadvantaged group is likely to be tourists turning up for a cross-river glide and discovering they've wasted their time. As for the tiny band of regular commuters, alternative cross-Thames routes are of course available. And they're quicker. Allow me to demonstrate using TfL's Journey Planner, with both journeys set for 3pm on Saturday 28th March (after the cablecar reopens). What's more, that 7 minute time is definitely an underestimate. A cablecar flight takes approximately 8 minutes thirty seconds these days, that's from doors shut to doors open, so goodness knows where that figure of 7 came from. They don't even do the speeded-up thing at peak hours any more, or at least they didn't when I took a flight late last month, so I assume those former five minuters are now a thing of the past. • As well as being quicker, a cross-Thames journey by tube and DLR is also cheaper. With Oyster it costs £1.70 in peak hours or £1.50 at all other times, which is at least half of the £3.40 the cablecar charges. Interestingly if you only have cash then the Dangleway is cheaper, at £4.50 rather than £4.80. Whereas if you only have a contactless card you'll be charged the reduced £1.50 by train, but the full £4.50 by cablecar, so screw you. • Danny Price also claims, in his press release, that "Since opening nearly three years ago passenger numbers on the Emirates Air Line continue to grow". Pick your data carefully and he's correct, pick your data differently and he's incorrect. Here's a table of weekly passenger numbers for the last three winters, in each case starting with the first full week in January (after the schools go back). In each row, the highest ridership figure is underlined. The overall story is of passenger numbers falling last year from initial highs, then rising again this year, probably thanks to increased promotion. There's a period from mid-January to mid-February where 2015 has the highest totals of all, but it then slipped back behind 2013 in the big half term week. Indeed for the last couple of weeks 2015 is at the bottom of the heap passengerwise, below even 2014, which may well be a reflection of the weather... or who knows, it's all terribly all over-the-place. But "The Emirates Air Line continues to cover its operating costs", apparently, so Danny probably doesn't care about a few insignificant ups and downs. • You're probably aware of the map on the TfL website which shows current disruptions to the tube service. What you may not be aware of is that there's also a disruption map for the Emirates Air Line, hidden on a dropdown menu, and it usually looks something like this. You can't beat a good old generic message about "the network", can you, even when the network's a mere two terminals. Perversely the map looks the same even after everything closes down in the evening (at this time of year 8pm), announcing a "Good Service" when in fact there are no cablecars running at all. Meanwhile what happens to the map in the case of disruption, say high winds or a planned closure? Well, the graphic changes, with the text box removed and the line itself shown in red. It seems odd to display useful words when things are running normally, and write nothing when things aren't working, but that's how this system is set up. But what intrigues me more, much more, is the label in blue beneath Emirates Royal Docks - "Trains to ExCel". The whole point of the cablecar, you may remember, is that it was supposed to link the O2 to the ExCel exhibition centre. And yet here we have an admission that it doesn't do the latter. Apparently the cablecar drops you off at Royal Victoria where you can catch "trains to ExCel", which may only be a minute up the line, but it seems TfL don't expect us to walk. In fact the western entrance of ExCel is only six minutes away from Emirates Royal Docks on foot, which is perfectly doable by most people, but this graphic totally overlooks that. Indeed it suggests that TfL's preferred route from North Greenwich to ExCel involves taking the DLR at the end... in which case why bother riding the cablecar in the first place? • And finally a confession. I've been on the cablecar a lot of late, and quite a lot of you have wondered why. "It's a bit hypocritical isn't it? ", said some, and "Does this mean you secretly love it?" said others. Neither is the case. Instead I was given a birthday present last year of a Multi-journey Boarding Pass, which allowed me ten free cablecar crossings over the space of twelve months. It would have been a shame not to use it, especially as this gave me the chance to report back on the in-flight feature tour, the app, the Snowdog and the Valentine's extravaganza. The only slight hitch is that my bit of cardboard didn't operate the gates, so I had to be let through by a member of staff each time after a) they'd noticed me and b) they'd clipped my ticket. My pass now has ten holes and has expired, so I won't be riding the cablecar so much in future, if at all. Should next year's passenger numbers drop, you'll know why.